From April to May 2013, to coordinate the construction of a reservoir, the Cultural Relics and Archaeology Institute of Sichuan Province excavated 68 cliff tombs. The main part of the tombs are located the west bank of Wenxi River, 57 of them densely distributed on the cliff over 400 meters from northeast to southwest, while some parts in the middle are in two lines; and there are also 11 of them scattered on the east bank of the river. East Han Period: 53 tombs in total, which mainly consists of tomb passage, vaulted passage, main chamber, coffin bed, niche, stove range, etc. All of them are single chamber tomb; the roof of the tombs are in two types, arc and dome; there’s no decoration in it; main chamber, vaulted passage, tomb passage are lined up, and on both side of the main chamber are coffin bed, stove range and other subsidiary facilities; while some of them have niches in the back part of the chamber, or in the right and left side chambers; drainage goes through the middle of the passage to the outside of the cliff. For draining, the back part of the bottom is always higher than the front, symmetrically formed. Most of the grave goods are pottery, while iron and bronze wares are also found. The pottery is in two major types: daily-using wares and pottery figurines. The daily-using ware includes jar, bowl, plate, zeng steamer, caldron, pot, etc; the figurines are various, such as figure, musician, acrobats, poultry and livestock, etc. 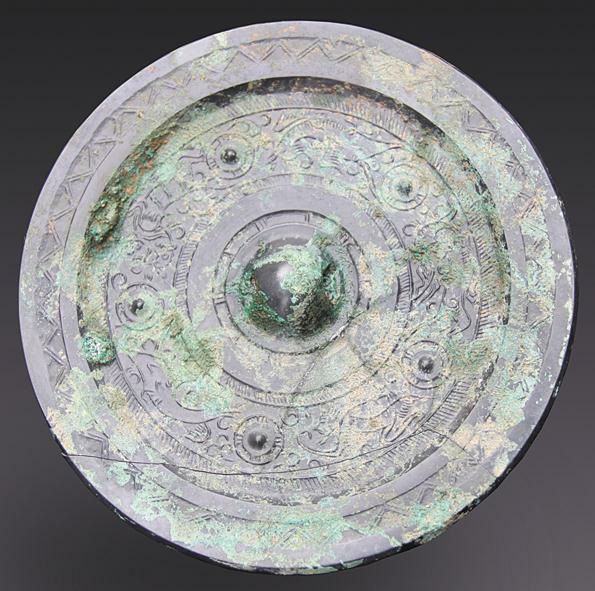 The bronze wares include Wuzhu coin, caldron, mirror, currency, and crossbow, etc. 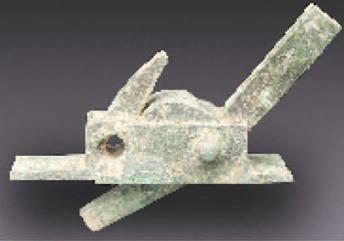 Most of the iron wares are knife, sword, and also daily utility caldron. M15 is typical one among the tombs during this period: rectangular passage, 1.06 meters long, 1.6 meters wide, 0 to 1.1 meters high; rectangular vaulted passage, 2.2 meters deep, 1.04 meters wide, and 1.06 to 1.3 meters high. The drainage is in the front of vaulted passage and it goes through the whole passage, which is 1.76 meters long, 0.1 to 0.16 meters wide. The chamber is in the shape of a rectangle, 3.16 meters long, 2.84 meters wide, the arc roof is 1.3 to 2.16 meters high; the chamber is 0.1 meters higher than the vaulted passage. Six Dynasties period: 15 tombs in total, which are smaller in size, 1.2 to 3.6 meters in length, consisting of passage, sealed door, vaulted passage, chamber and coffin bed. All of the tombs are vertical shaft. On one side of the chamber, a coffin bed was made from the original rock, some of which are rectangular and few of which are in trapezoid shape. The back part of the bottom is higher than the front for draining reason. Most tombs haven’t any grave goods, except few of them. 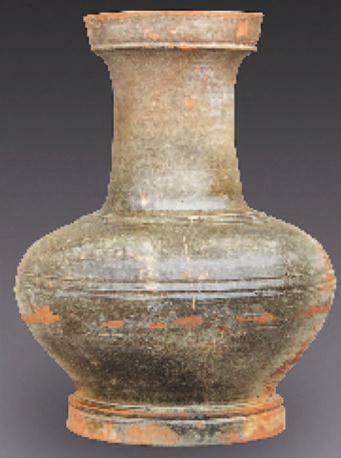 Most of the items are pottery jar, while copper bracelet, glass ware and other ornaments are also found. M9 represents this period: rectangle passage, 0.4 to 0.46 meters long, 1.18 meters wide, and 0.08 to 0.66 meters high; rectangular vaulted passage, 0.76 meters in length, 0.66 meters wide, and 0.66 meters high. The main chamber is vertical shaft, 2.44 meters long, 0.66 meters in width which is the same with the vaulted passage; arc-shaped roof, arced to the back of the tomb, 0 to 0.64 meters high. The chamber is 0.1 meters higher than the vaulted passage. The whole cemetery is in regular order, a cross of two lines appears in the middle part, broken each other relationship is rare. Unfortunately, most of the tombs are destroyed, some of them are severely collapsed, but plenty grave goods are unearthed. It is largest in number excavated at once in Guangyuan area, providing rich materials for the study of cliff tombs in Sichuan Province.